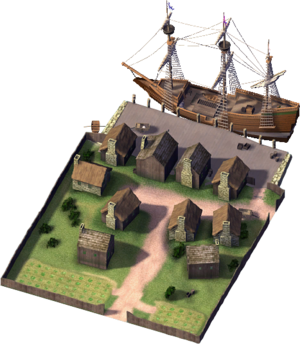 The Mayflower Port is a downloadable Landmark Building for SimCity 4 Rush Hour/Deluxe, released as the Plugin Pack 032 free Downloadable Content. It is a recreation of the port of the Mayflower in Plymouth, Massachusetts in the United States of America, as it may have looked not long after its landing, maybe in early 1621. The News Ticker fluff entry created on its placement is "Mayflower Port Docks In #city#". This building is the only DLC building to have a custom foundation overriding the default one.